Warner Baxter plays Adam, and he has four sons: Richard Denning, Johnny Downs, Robert Shaw, and Charles Lind. He's in charge of a grand estate, but when his wife dies and his fortune is wiped out, he has to scramble to be able to afford his lifestyle again. Ingrid Bergman plays the governess who helps him pick up the pieces of his struggling family. When the boys grow up, some marry and some enlist in WWI-what will happen to the family dynamic? If you like movies about governesses sent in to take care of a brood of children, you'll probably like this one. 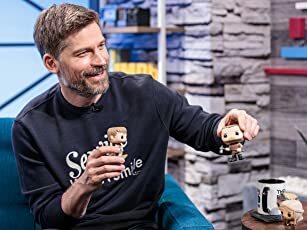 It's got all the elements: struggles with the children, eventual acceptance and bonding, a little romance with the father, and family tensions when the children grow up. 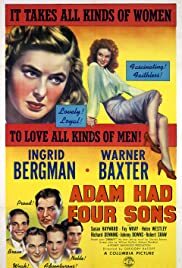 Ingrid is always very good when playing someone strong, so if you're a fan, you won't be disappointed in her performance in Adam Had Four Sons. Even though the title features Warner Baxter's name, it's Ingrid who's the star of the show. She may be only the governess, but she's the glue that keeps everyone together. And keep on the lookout for a young Susan Hayward in one of her first major roles. She's beautiful and cunning, and it's amazing that she wasn't forever typecast as a villain after a movie like this!